MP3 Workshop is an older tool which can do various things with MP3 files and rip CD audio from an audio compact disc and convert those files to MP3 files for playback on your phone or your preferred media player. The program is not free and considering its age, not really worth the time or money to invest in as it seems that MP3 Workshop is now abandonware. With all of that said, the program is capable of cutting, joining and ripping MP3 files. MP3 Workshop is also capable of editing MP3 IDv3 tags as well as actually playing back audio files. 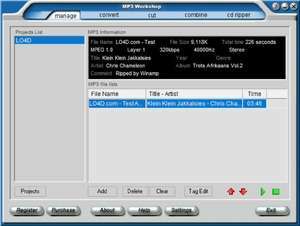 MP3 Workshop 4.80 is a shareware program and can be used as a demo to try the software until the free trial period has ended. A full version of the program is available after the trial period ends. For security reasons, you should also check out the MP3 Workshop download at LO4D.com which includes virus and malware tests. Additional screenshots of this application download may be available, too. MP3 Workshop has a presence on social networks.